The best part of living on Earth is that every once in a while you stumble upon a place that is positively out of this Earth. Simply breathtaking. That kind of place that makes you proud to be an Earthling. Not to rub it in for all of you extraterrestrials, but you have to wonder if Mars has any place that would be out of this Mars. Methinks not. 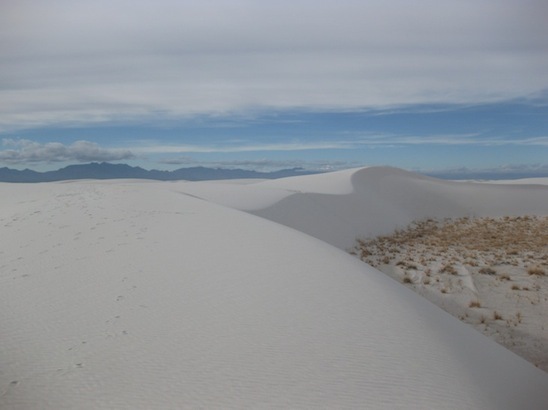 One such magnificent place is the White Sands National Park in New Mexico. The world's largest field of gypsum dunes located just a short drive from Las Cruces, NM. It isn't exactly on the beaten path though. It took me some 15 years to finally make it there despite the fact that I spent 2 year of my life living in Los Alamos, NM - merely 300 miles to the north. If you ever happen to be in the Albuquerque area, however, you may give it a serious thought - doubly so if you are heading south or if you have ever wondered what the world would look like if it was made out of sugar. That landscape is noble like a duchess on her wedding day. Her veil undulating in the wind. Grains of the finest rice strewn all over the ground. The delicate laces tying up the horizon in muted elegance. This is the fantasy planet you always wanted to wake up on. Especially if you are an hour glass. But whether you are into sand or not, you will enjoy the gently rolling curves and powdery heaps quietly conspiring to a future blizzard symphony. A choir of never-ending snow drifts rendered in the most festive tones of white. You can even take a hike deep into the dunes and if you squint your eyes a bit, you may get an impression that you are dreaming of a white Christmas. And perhaps you are. I did not see any signs that would place any kind of restriction on dreaming. Indeed, dreaming is what a place like this is for. There are 17,000 alcohol related car accident deaths in the United States each year. There are 9,000 murders with firearms. On top of all that 3,000 people die every year in a fire. And that's just the beginning. Dismal statistics surround us from dawn to dusk and throughout the evening news. So much so that we have grown somewhat immune to their ominous presence. But every now and then a tragic event protrudes from the daily noise of data streams with contours so brazenly shocking and so factually inconceivable that it shakes us out of our stupor and makes us question the very basic premises and principles on which our society is built. The shooting in an elementary school in Newtown, CT which took 27 lives, including 20 children, was a wake up call of that sort. The sharp and penetrating spear of its pain drilled deep into the numb layers of our subconsciousness and brought billows of half forgotten sediments uncomfortably close to the surface. No doubt, guns will be featured prominently in the ensuing blame game. In fact, several scouting parties are hacking their way through the jungle of gun control laws as we speak. If the headlines of the past few days are any indication, we should get a pretty spirited discussion on just about any aspect of the Second Amendment. What strikes me as equally important, albeit commanding much less media attention, is a question of our mental health. We pride ourselves in keeping our bodies in tip top shape, but in the barrage of healthy living ads we seem to be neglecting our mental fitness altogether. Shouldn't we pay equal attention to grooming our psyche? Specifically, what we should very seriously ponder - at least until the next heinous news story diverts our attention elsewhere - is how did we allow for an environment in which a young mind can grow so barbaric that it would embark on a premeditated murderous rampage and execute whole classes of school children in chillingly cold blood. Our soul is just as complex and fragile as our body. We simply do not understand all the ramifications of an intricate chain of dependencies which its functionality represents. We do not know what makes one mind grow perfectly healthy while another slips into intolerable extremes under the very same conditions. One factor which I think should make an appearance in the hypothetical debate is the emotionally barren milieu of mass media in which many of our children grow and develop. Back in the days of my larval stage, long before the advent of Facebook or MTV, I spent most of my summer holidays at my grandfather's farm in Northern Bohemia. There we flew kites, chased trouts in the local creek, roasted potatoes in a bonfire, watched the rye fields undulate during the harvest, climbed sandstone rocks and sometimes fell from them and scratched a knee or two. While playing in this slow rural setting, we had enough time to intuitively understand how important observing certain rules was, how important hard work was and by extension how important each and every life was. And the reason we absorbed all of this relatively well was that it had been presented to us in a natural unbleached form which our minds tend to process rather easily. I am afraid today's world dominated by the TV networks and the Internet robs our kids of something very precious. The organic experience of the countryside which can form a sense of perspective with the same kind of ease with which our bodies digest natural vitamins. And it gets worse. Our inner world isn't the only victim of potentially harmful pollution - we should also carefully re-examine the role of drugs, especially those designed to remedy mental disorders and prescribed to children and young adults. Sure these magic pills are being nominally tested. But monitoring two groups of people for a few weeks while tracking some trivial response mechanisms is not good enough. Drugs affecting our cerebral functions are a bit more complicated than aspirin or alka-seltzer. There may be subtle long term damages which lay hidden deep underneath the veneer of social protocols until suddenly activated by a chance signal. Kind of like when you randomly swap two wires in your computer and for a while it functions in a perfectly normal way, until one day you do something slightly out of the ordinary and the whole contraption goes bonkers. Pouring crude human made chemicals into the sophisticated circuitry of our brain is a recipe for disaster. You never know under what synaptic connection they will flap their dark wings. It's like allowing a second rate house painter with a broad brush to tinker with Rembrandt's finest paintings. It may all sound like a well meant act of healing, but unless all side effects are well understood, such efforts may very well turn out to be an embellished gate to the maze of unintended consequences. And the only thing we can possibly get in return for passing through such gate is an occasional silence of the angels, echoing wildly in the moral hollowness which created it. In the rapids of life, the good and the bad are so thoroughly intermingled that it is virtually impossible to have one without the other. No matter how hard you try to navigate through the staccato of consequences, no matter how hard you deploy the paddle of your will, your canoe will be mostly left to the mercy of fiercely turbulent elements. As we are tacking left and right through our destiny, sometimes the wisest thing is to relax and just enjoy the ride. Because no matter how well you design your trip, there will always be mischievous elves planting dynamite sticks in the folds of your plan. And sometimes those dynamite sticks are exactly what brings you the good stuff. This Thanksgiving I was hiking in South Arizona with a friend of mine and for the first day we planned the conquering of the Wasson peak, one of those sharp saguaro infested heaps of dirt overlooking the Tucson area. Due to a slight delay at Tombstone, we arrived at the site late in the afternoon. We had barely enough time to climb to the peak so we quickly hopped onto the trail and started crunching the miles as we did not want to risk coming back in the darkness and stepping on a tail of some disgruntled rattlesnake. However, after about an hour of walking we strayed from our path a bit and got lost in an arroyo which seemed to lead in the right direction, but ended up at a stern rock face which was clearly not passable, unless you were a lizard or had suction cups for fingers. To make matters worse, on our way back to where we lost the trail we tried to utilize a seeming short cut which turned out to be an access road to some abandoned mine so all this backtracking and wandering cost us a good hour of our limited time. Wondering whether we should call it off or not, we recalculated how much time we have left before sunset and decided we'd resume going up the trail until the point that would still allow for safe return (which was about 4.45pm). We wanted to get as high as possible, so we put the pedal to the metal and darted off like a pair of hungry wolves that just intercepted a scent of marinated lamb chops. When we reached our point of safe return, steaming profusely, we were only about 20 minutes from the summit which was well within sight and tantalizingly beckoning in our general direction. We couldn't quit and start our descent now, so after a short pow-wow we kept pushing forth for a bit longer - damned be the consequences. When we reached the top, some 15 minutes later, we were spent and panting, but the helter-skelter climb was worth it. The views of the surrounding ranges were dazzling and the sense of accomplishment nearly intoxicating. The time shift caused by the unfortunate digression may have jumbled our time table but it also enabled us to see the mountains in the precious light of the setting sun which bathed their every fold and cranny in a surreal reddish glare. And that was not all. Since we had no chance of reaching the parking lot during the daylight, we were about to experience an adventure hike in night conditions - an endeavor we would not have attempted if we actually had a choice. And that was also the last basket of perks which the forced departure from our schedule laid at our weary senses: the silhouettes of cactuses barely visible against the fading sky, the low keyed humming of the attentive desert and last but not least the faint lick of light leaking across the western horizon. All of that because we lost our way. I haven't heard Max Bruch's Violin Concerto for more than 20 years. It is a remarkably inspired piece of a rather obscure romantic German composer whose concert presence does not usually extend too far beyond this gem of violin repertoire. But its fresh melodies will forever secure his place on the musical Olympus. If you let them in, they will percolate through your mind like a creek of buttercup petals cascading down an alpine meadow and carry you forward in an unstoppable fete of youthful energy. I used to listen to them quite often when I was in my 20s but I do not think I heard it - live or recorded - ever since I left my old country. I haven't been to Albuquerque for quite some time as well. I left New Mexico some 15 years ago and so it must be at least that many years since I last coasted on I-40, the interstate connecting Albuquerque with Arizona and eventually California. This November I was coming back from Arizona with a friend of mine and the last leg of our trip lead us back into I-40, the long forgotten highway passing through many towns whose name had that vaguely familiar sound of distant memories floating restively through the hallways of our recollection. As soon as we merged into a light flow of traffic, I started scanning the local radio waves to enliven the monotony of the New Mexican semi-desert and I thought it was quite appropriate when I hit the Bruch's concerto being performed on some classical station. If you asked me about it a moment ago, I would not recollect a single note of that piece. But as the music climbed out from its dusty cocoon, unexpected magic started unfolding. Familiar phrases and motives emerged from the deep recesses of my memory, like beloved people I did not see for a while but instantly recognized: "Oh my God, uncle Joe, you haven't changed in 20 years". The sudden appearance of this violin concerto was like a flying carpet which turned a potentially boring drive into a resplendent cruise in the memory lane. It amazes me what quantity of information our mind stores. Much of what we think is lost forever just hibernates in the cool cellars of our memory. There it lies dormant in a way which is unobtrusive, but when poked in the ribs it bursts to the surface with an amazing level of detail. To remind us who we are.